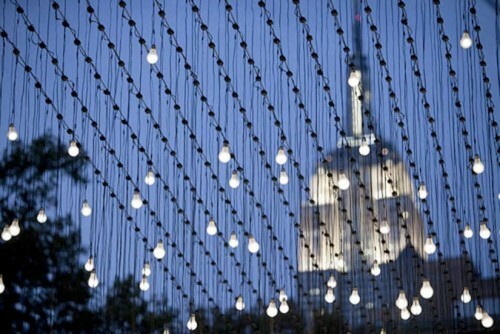 Upon first stumbling across this massive array of 2,000 LED lights encased in standard light bulbs in Madison Square Park a few weeks ago, I thought holiday decoration had come a little early to the Flatiron’s front yard, but as shadowed figures began moving across the field of light, it became apparent that this installation by artist Jim Campbell was something special. 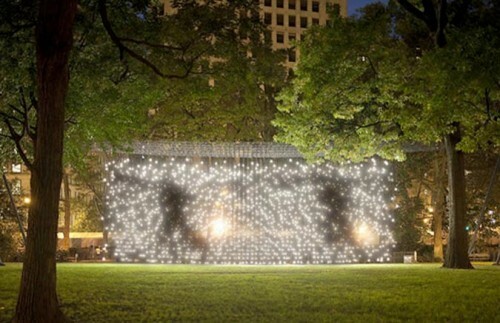 Situated on Madison Square Park’s Oval Lawn, Scattered Light consists of a three-dimensional grid of light spanning roughly 80 feet by 16 feet and standing 20 feet tall. When viewing the installation from the front, programmed LED lights flicker in sequence to create the illusion of shadows walking through the park. Moving around the artwork causes the image to blue and abstract as the grid moves in and out of focus. Broken Window, the second installation, will be situated near the main entrance to Madison Square Park at 23rd Street and Fifth Avenue. An array of LEDs encased in a glass-brick wall (70”h x 70”w x 10”d) will create illuminated images that appear to glide across the glass plane, reflecting the movements of the city around them and echoing the aesthetic poetry of the Scattered Lightinstallation. Situated on the eastern lawn adjacent to Madison Avenue between 24th and 25th street, Voices in the Subway Station, the third installation, will feature LEDs encased in two dozen glass tablets (14” x 18” each) arrayed across the lawn at ground level. The light pulses emanating from each tablet will be rhythmically modulated to represent the voices of individual travelers as recorded in conversation on a subway platform, combining to create a visual symphony rendered in light. Each of the three installations offers an abstracted experience drawn from the urban environment that’s at once distant but right at home and it’s worth an evening stroll through the park to experience them for yourself. The installations will be on display through February 2011.